Live From Kent...: Good riddance 2008! Well well, here it is, the last day of 2008. I must say I am not sad at all to see this year end! While no year passes without ANY good happening, it seems this year was extra full of challenges for myself and this family, not to mention the nation and world as a whole. All in all, this has been a rough year for a heck of a lot of people! Of course the bad things that have happened to me and this family have been well-documented on this blog, at least the major stuff. The whole situation with the house is the obvious winner for bad news and gets 2009 off to a rough start. A lot of the grief I have had with certain people at Kent State has had a shadowing effect as well and again, some of that will carry into 2009 too. The house situation seems to be related to a lot of the other problems we have, family relations in particular, but the good news is that it will almost certainly be resolved in 2009. Whether or not that resolution is to our liking remains to be seen of course. The only thing that could make finding out about this situation any worse would be actually losing the house. What I do find interesting is that while most of our major problems have to do with money, they are largely unrelated to the economic problems around the world. Even in the 1990's when the country was booming, we were never that well off. For me, the biggest thing I am looking forward to is graduating in May, though before I get to that point two things have to happen: I have to pass student teaching satisfactorily and I have to pass another section the Praxis. Both are things I am certainly capable of, but nevertheless they are hardly simple things, especially student teaching. The good news is that I already know most of the students I will be teaching and they know me, so going in come January 26 won't be a huge event or much of a mystery. Once I get through that part of my life, I can finally move beyond being independent, something I have longed for. With all the bad stuff that has happened, though, I thought I'd look back at the year and reflect on the good that has happened. First, we are still in the house and I am grateful for that. When Dad told us in May there were fears we would be out of the house by the end of the summer. Only when that didn't actually look imminent did I finally start taking care of summer projects, most of which I did after I bought a much-needed chainsaw. Another plus for 2008 was graduate school even though it has brought it's fair share of frustration and stress. My summer classes were things I actually enjoyed going to and the people I was around were people that made me feel good about myself. That carried over into Fall, and while I really almost detested all of my undergraduate classes (except the Instrument for Choral Majors class), I enjoyed at least being at my graduate classes . Not only did I enjoy the people I was around, but I also enjoyed the class structure and actually having meaningful discussions. My undergrad classes really lacked that. Along with that, I have enjoyed being at Southeast Middle School and Southeast Intermediate School and am mostly looking forward to student teaching there at the end of January. 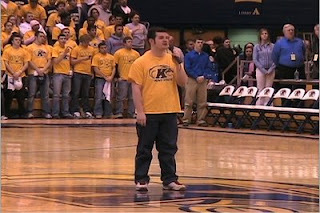 One of the biggest things I was grateful for and got to do a lot of in 2008 was sing, particularly the national anthem. I lost count how many times I did it in 2008 as I sang for almost every home game for both the men's and women's basketball teams at Lake Erie College in Painesville, Ohio and I got my fair share of KSU games too. The game in January against Akron was a highlight, but I thought I did better at the game against Miami just over a month later, which had almost as big a crowd as the Akron game. I have been able to sing at 2 more KSU men's games already this season, plus I got to sing at this community breakfast in Stow on July 3 which was a lot of fun and a great experience. It's funny yet sad that the biggest chances I've had to sing, despite being a music major, have been in athletics, not in anything from the KSU School of Music or the BYU-Idaho Department of Music. The only solo time I ever had at either school was in studio class (called "master class" at BYU-Idaho) and my own recital in December 2006 where about 15 or less people showed up. It wasn't that I didn't try out for solos (though eventually I did), but I was just never "what they were looking for" I guess. Along with singing the national anthem, I got to go to a TON of sporting events this year, mostly high school and college and a few Cleveland Indians games. I always enjoy attending sporting events, though too often I do so alone! Of course I got a good amount of singing time in church too both at my ward and at the stake level too. It was pretty exciting to sing for a stake meeting, which I did back in September. I really enjoyed singing in the Christmas program at Church on December 21st as well. I love to sing and while songs like the "Star-Spangled Banner" can be very difficult, I really enjoy singing them. The "Star-Spangled Banner" in particular can be very difficult for even experienced singers, but I have come to really like it (come to think of it I always have) because it opens itself to a lot of creativity and interpretation, plus I have always thought my voice fits it pretty well. Another highlight for me was the trip I took with Katie to visit Andy and Heather in the Washington, DC area during Spring Break in March. Not only did I get to see several sites that I had been wanting to see, but I got to spend a lot of time with Katie and of course Andy and Heather. It's funny how being apart changes relationships. Growing up my brother and I were very different people who had similar interests. I couldn't stand to be around him, particularly in high school. It was bad enough that, as I have mentioned before, I only wrote him a few times while he was on his mission because I really didn't have that much to say to him. Well, since he got back from his mission, we have gotten along much better and enjoy being around each other, though since then we haven't been together much over a week. Even during Andy and Heather's latest Christmas visit, we didn't see them every day (they were here for a week). Added to the better relationship with Andy is Heather. She's just someone I enjoy being around because she's so genuine. Even though we really didn't spend a whole lot of time with either of them while we were in the area (they were both busy with work and school), the time we were able was a lot of fun. I'm very anxious to see where they end up for Heather's residency! There are many other joys in my life that I experienced or began in 2008. For one, I'm still in Primary playing the piano, plus I have had the awesome experience of being executive secretary and all that comes with that calling, plus as acting choir director, I have been able to do a lot more now that we have Brother Brian Ebie at the helm of our music program and at the organ. What a difference! I've also really enjoyed teaching piano to my three students. The family is a joy to be around and I'm learning a lot about being a teacher at the same time (plus it keeps me on my toes with my own piano playing along with Primary). And let's not forget the purchase of my Ipod Touch and my super awesome laptop. Both are things that I have used and enjoyed since getting them this summer. There are many little things I need to focus on this coming year, mostly things like reading my scriptures regularly, writing in my journal regularly again, and getting to bed at a consistent time, epsecially since I'll be at school so much from now on. Once school starts I'll get on a pretty regular schedule since every day will be the same classes for me and time I need to leave. But anyway, there were definitely lots of wonderful things (sure there are more I'll remember soon!) that happened in 2008, but it goes to show the magnitude of our current situation and how much it is hanging over us. Here's to a better 2009! First of all. . .the facial hair thing looks really good on ya!! Second of all. . .2008 BITES and is as ugly as a certain lady that tried to rob a certain cradle. I think everyone is excited to see it go! Good luck in 2009!!!! 2009... wahoo!! You definitley had a hard year, but next year will be awesome (and the awesomeness will increase if you come and see me in Utah... that is all!) 2009 will be AWESOME!! !